Goddess Durga is one of the most popular goddesses in Hindu religion. She is the Divine Mother and representation of compassion, strength, morality and protection. She protects her devotees from evil powers and safeguards them. It is believed that Goddess Durga is said to be the combined form of powers of Goddess Laxmi, Goddess Kali and Goddess Saraswati. 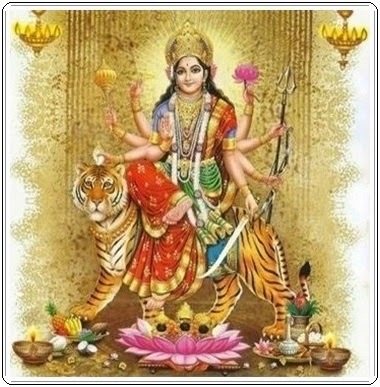 Na Jane Mudraste Tadapi Cha Na Jane Vilapanam Param Jane Matastvadanusaranam Kleshaharanam"
In this Prayer the Devotee addresses Durga as Maa (which means Mother) and tells her that he does not know any prayer, mantra or any magic summons for Durga. He also admits his ignorance that he does not know how to meditate on Goddess Durga nor does he know much about her story and glory or the various postures of Durga. He further says that he is seeking shelter and protection from Maa Durga as following her command will definitely put an end to all his sufferings. In most of the prayers to Goddess Durga ,the person reciting addresses himself as an incompetent and ignorant who only knows that that if he prays her, she will offer her unconditional help to him and save him from all his miseries by giving him courage and strength for facing all troubles. Goddess Durga is respected and referred as the mother of whole of the world and all nature who protects her children from all troubles. How much ever a son/daughter be bad, can a mother be cruel and hate or leave her own child? The Durga mantra is the one which has in it the best way of reaching towards the motherly Goddess Durga who would never let her children down. Maa Durga is that Mother to whom we can have a soul talk about our sufferings and troubles and ask for mercy and forgiveness if one has done a wrong deed and be rest assured that Durga Maa will never let you to be in distress. "AUM AING HRING KLEENG CHAMUNDAYE VICHCHEY AUM"
"Ya devi sarvabhuteshu, shakti rupena samshthitha Namasteshwai Namasteshwai Namasteshwai namo namaha".